Border and battleground between Orient and Occident, a vast wilderness interspersed with the highest flowerings of civilization, the last bastion of the true hereditary autocrat and the first domain of the modern dictator - Russia is ever a land of contradictions and conflicts. In the world of Victory: War of Bronze, that violent dialectic never lulled. Now, the slightest shift in the balance of power could turn the Russias into the bloodiest battleground of the Second Great Conflict. Flashpoint! Russia is your introduction to the rapidly heating war in this cold land. 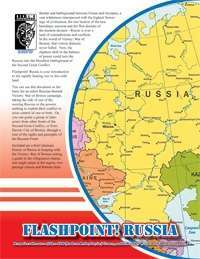 You can use this document as the basis for an entire Russian-themed Victory: War of Bronze campaign, taking the side of one of the warring Russias or the powers seeking to exploit their conflict to seize control of one or both. Or, you can guide a group of characters from other fronts of the Second Great Conflict, or from Haven: City of Bronze, through a tour of the sights and gunsights of the Russian Front. Nearly 15 All New Feats including Clear Mind, Hypnosis, Mind over Matter and Suppress Memory. This 11 page PDF is just the sort of thing needed for GMs to add depth to any great d20 Modern campaign world, including Haven: City of Bronze and Victory: War of Bronze. Written by Joshua Cole. This title was added to our catalog on February 19, 2007.